Myrotic to the Bucks for Jason Smith and Stanley Johnson per Woj. Basically gave him away, so we shouldn't feel too bad about what we got for Barnes. Edit: Nevermind, NO is getting second round picks from the Pistons somehow? Woj's tweets are a bit scatterbrained. 2nd round picks might as well be nothing. Most 2nd round picks never see any NBA court time. Mark Gasol to Toronto per Woj. No details yet. Toronto will have some amazing screens with Ibaka and Gasol. It'll be fun to see both Toronto and Milwaukee in the playoffs. I can't imagine Boston or Philadelphia being on their level now. I stand corrected. I missed the move by Philadelphia. Very nice! Boston's screwed... for now. Boston's big move is holding chips for Anthony Davis. I’d like to see Kanter on the team just for the defensive lols, but I’d imagine he goes elsewhere. Kanter may go to the Celtics, and Gortat may go to the Warriors. Both seem out of the conversation for the Mavericks. Now what will the Mavericks do with the $21.3 million trade exception? Seems like a waste not to use it. Let's say Dwight Powell opts in to the final year of his contract, and he totally will. That's $10,259,375. Add that to the $21.3 million exception. Then the Mavericks can get a player who is being paid ~$31.5 million or maybe a player we want and get a bad contract in return. 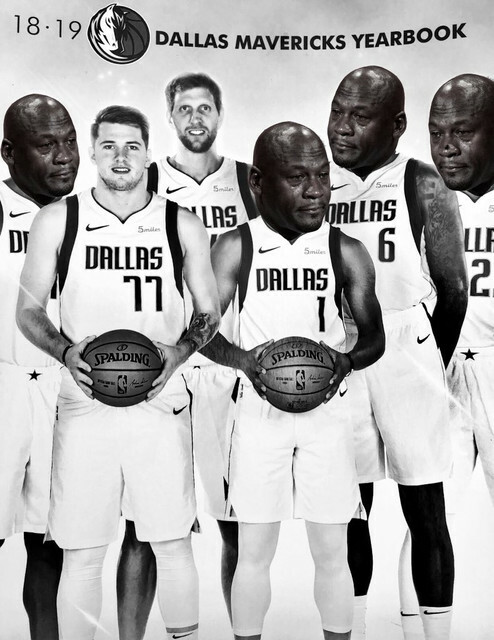 Regardless, the Mavericks should be able to make something work. This is exciting! I'm sure you all have thought up different scenarios. What do we do first? Do we sign a free agent? Then work out a deal with Porzingis? Then use our exception in a trade? What makes sense here? I think we should be able to make 2 huge moves in addition to signing Porzingis. Am I right in my thinking? If Porzingis is getting the max, the right thing to do is to use up the cap space, then sign him. He's a cap hold of 17.091. His max for the years he's played 0-6 years is 25% of the cap. Cap is estimated at 109 million for 2019-20. So his contract based on the assumption he's getting maxed would be 27.25. So for 10 million, you get everything done that needs to eat up cap space before you ink him. I can never get over the fact that one player should ever be worth that much. I feel like all of the regularly played guys on the roster deserve to be paid more equally. I get that those on a rookie contact won't. Nor will many veterans who take the minimum. But getting 1/4 of the payroll is just crazy. I think it's actually the opposite. If it weren't for the max contract cap a few players would get MUCH more than they are paid now, and we wouldn't see so much of the top talent stacked on half a dozen super teams. I think it would make the league much more competitive if the best players could get paid what they're worth. The player's union is unlikely to vote for that though. Last edited by particleman; 02-07-2019 at 05:17 PM. I agree. I think there is WAY too much "equality" in the way players are paid. There's no earthly reason second and third tier players should get paid like superstars.